Join our #FairHer Twitter party! Our #FairHer Campaign is here! We're excited to celebrate the many incredible women of Fair Trade - from the farmers & workers behind our Fair Trade products, to the women who work at the places that sell Fair Trade products, to the women who advocate for Fair Trade! Together we are FairHer - now let's celebrate! Join Patagonia, West Elm, DAVIDsTEA, prAna, Heifer International, UNICEF USA End Trafficking project, Dillanos, Love146 and FairTradeUSA on May 3rd from 5-6pm PT for a Twitter party about Fair Trade's global impact on women and easy ways to Fair Trade your Mother's Day! Just use the hashtag #FairHer to attend! And what would a party be without prizes? Lucky attendees will be entered to win Fair Trade goodies to get them started on their sustainable shopping adventures. Just join the conversation using the hashtag #FairHer to be eligible to win! See you there! 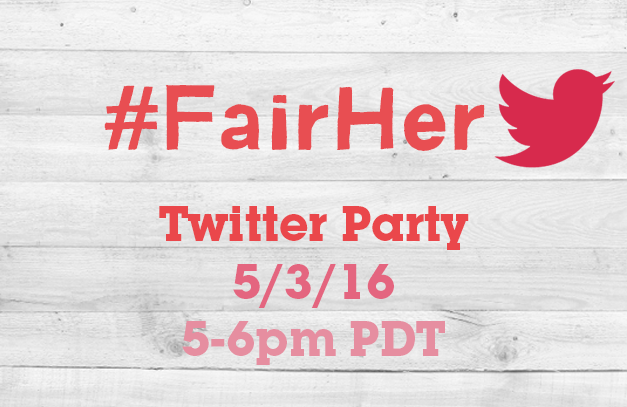 Twitter Party Rules: Beginning 5/3/16 at 5:00PM PT and ending 5/3/16 at 6:00PM PT, participants must use the hashtag #FairHer in order to qualify to win a prize. (NOTE: winner must be participating in chat and not just retweeting). Neither the party sponsor @Patagonia, @WestElm, @DAVIDsTEA, @prAna, @Heifer, @EndTraffick, @Dillanos, @Love146 nor @FairTradeUSA is responsible for misdirected or undeliverable Twitter updates, including those from private Twitter accounts.